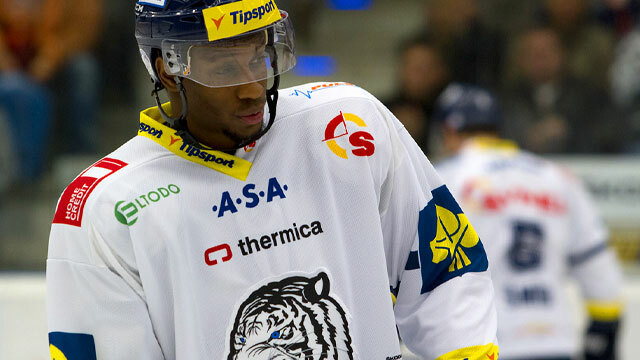 Wayne Simmonds became the first black player to play in the Czech Extraliga this season, as the Philadelphia Flyers forward recently left 2.Bundesliga side Eispiraten Crimmitschau along with Chris Stewart and signed up with Petr Nedved's Bílí Tygři Liberec. Simmonds, who had played two games in the Extraliga before Sunday's game in Chomutov had got off to a confident start with the Czech side, but unfortunately in the third game, the NHLer was subject to racial abuse by a section of Pirati Chomutov supporters. Chomutov, who only joined the Extraliga this year have got off to a solid start playing wise, but this incident will certainly pose problems for the club. The racial abuse, claimed by iSport (source), involved monkey chants being directed towards Simmonds. The taunts, allegedly came from the 'boiler' section of the Chomutov crowd, which are better known around the world as ultras. The abuse is said to have come at the end of the game, after Chomutov won the game in overtime. While the club have been quick to disassociate themselves with the fans that abused Simmonds, it does give a sad reflection into the cultural issues which have continually clouded the Slavic world since the fall of socialism in the late 1980s. Only a few weeks ago, there were vehement claims of racial abuse directed towards black English U-21 footballers whilst they played an away game in Serbia. Pirati Chomutov, and the majority of their fans do come out of this with some credit. On the mainpage of the clubs website, there is a long statement and a written apology to Simmonds. Marketing director David Dinda is quoted as saying: "We are disgusted by the behavior of a group of spectators, who greatly damaged the reputation of the club. We would like to deeply apologize to Simmonds and all the players of the Liberec team". General manager Jaroslav Veverka was particularly honest in his assessment of the situation on the same page. "Today we got two points (important points). However, what some of "our" fans showed was the worst I've ever seen at a hockey game! It was embarrassing and pathetic. I ask these people to not attend hockey games in Chomutov. The club in no way endorses their opinions and absolutely does not respect them! On behalf of the partners and the owners of the club, we say in addition: Do not come to hockey in Chomutov! We are not interested in fans like that!". Veverka also went on to say: "We will do everything possible to prevent entry to the people who were the originators of these chants. And it will be permanent". At the bottom of the page is a written apology to Simmonds, where the club claims that they do not consider those who gave the abuse fans of their club, and that they are sincerely sorry for what occurred. All these words from Chomutov look good on paper, but unless they prevent it from happening again when Liberec play in Chomutov then they will be hollow. Also, steps must be taken nationwide to stop this from becoming a common occurence whenever Simmonds and his Liberec side are playing away from home. Sports and conservative opinions have always been closely linked, especially in the former Eastern Bloc, but it is simply unacceptable in this day and age, for such a quickly developing country for such events like this to take place. Despite what Pirati try to state in their statements, the club and the Czech Republic comes away from this fiasco with egg on their faces. We can only hope that Simmonds is able to continue playing for Liberec without the fear of racist chants coming from the crowds, and that he is able to enjoy his stay in the Czech Republic, for however long he remains there. English student with a penchant for Central and Eastern European ice hockey.